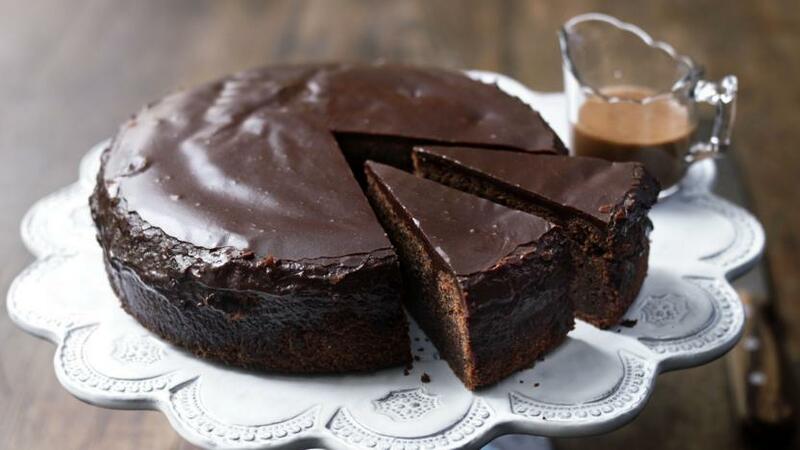 Adding cola to this chocolate cake makes it incredibly moist and impossible to stop at one slice! Heat the oven to 180C/350F/Gas4. Sift the flour, sugar, cocoa and bicarbonate of soda into a bowl. Melt the butter and cola drink gently in a pan then add to the dry ingredients, together with the milk, eggs and vanilla. Mix gently but thoroughly and tip into a buttered, loose based cake tin (24cm/9½ in diameter). Bake for about 40 minutes or until a skewer inserted into the centre of the cake comes out clean. Remove from the oven and leave for about 15 minutes while you make the topping. Put the butter, cola drink and cocoa into a pan and melt slowly. Bring the mixture to the boil and then pour onto the icing sugar. Beat until smooth and pour over the cake while still warm. Cool the cake in the tin. Serve with the sauce, made by melting the chocolate bar gently in a pan with a splash of cream (you may want to add a little warm water to achieve a pouring consistency), stir in the marshmallows if using.